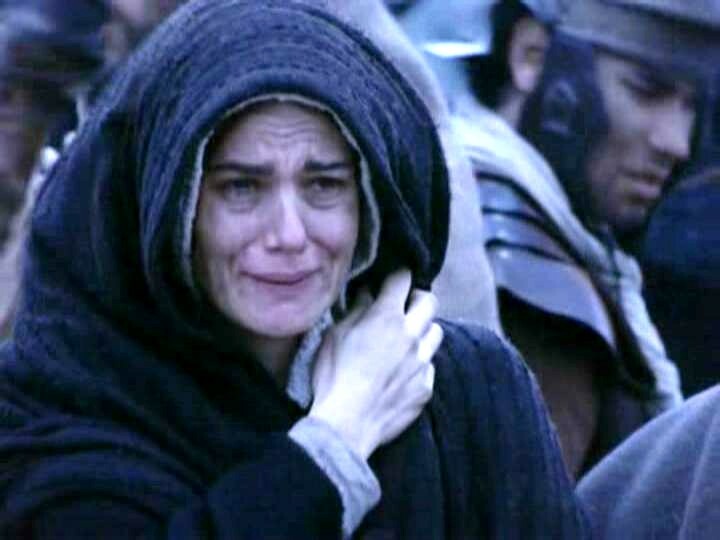 In searching for a Good Friday image, I came to rest on one of Jesus’ mother watching her son die a slow death. There was nothing she could do. In her face is the absorption of all things wrong and horrible. As incomparable as it may be, one can’t help but identify, empathize, put oneself in her place as her experience relates to ours, to mine. Jesus was God, yes, but also human, with agony, pain, love, affection — and a mother, who loved him like we love ours. When Ted was slipping away from us toward his addiction, I took strong note and comfort of Jesus’ interactions with mothers. Jesus was in a town when He peripherally saw a mother grieving her dead son in a funeral procession. He felt for her, and said with compassion, “Don’t cry.” Then He brought her son back to life. There’s no account she spoke to Him at all. Maybe He thought about how His own mother would feel in the not-to-distant future and it broke His heart — how a mother feels when all she can say is, “He is in God’s hands.” I have had that moment, have you? It’s the letting go and letting God without a choice thing. Today on Good Friday I sit in a pew and hear the profundity of the last words on earth Jesus chose to say. He addressed his mother in one of those few sacred comments, and handed her over to the care and protection of his beloved friend, John. There was everything going on up there on the cross, and yet God the son reassured His mom. She was important to Him — a priority you could say. He made arrangements for her. There are Bible examples of dads too of course, who care deeply about their children, but when God constructed a mother’s heart He added a magnetic veneer which pulls toward her children. When illness, distance, alcohol, drugs, evil or accident block the force field, “in God’s hands” is all that can be said or done — it’s not our visceral reaction but it’s where they need to be. God the Father’s hands were not nailed down. And so, as The Son was in His Father’s hands, so was Mary, His mom. As our children are in His hands, so are we mothers. He who created that bond would not deny it. Some of you have mothered young people with a heart-bond and commitment like a mom. It seems God has handed His own over to your care as John got His mom, Mary, and Mary got John. You have yearned for their welfare, and prayed for their problems. Maybe when their mother put them in God’s hands, that meant they landed in yours. You know who you are. Thank you. Absolutely beautiful post Sarah. How hard we try to “fix it” before we turn it over to GOD, when that is the first thing we should do. Prayers and love. Truly moving. God understands a mother’s heart. He made us this way. Thank you Sarah for such good thoughts.